Product Features New Technology 6-Cell Acer Aspire 4710 Battery rated at 11.1V, 49WHR, 4400mAh. 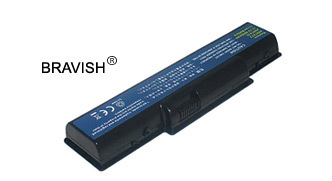 Replacement battery is guaranteed to meet or exceed original Acer Aspire 4710 battery specifications. These are quality made Technology laptop batteries manufactured with premium lithium cells. Li-ion batteries do not suffer from the memory effect. These batteries also have internal circuit boards with smart chips, which allows the battery to communicate with the laptop to monitor battery performance, output voltage and temperature. - High quality and rechargeable ( between 400 to 600 charge-discharge cycle). - Product Type : Replacement Laptop Battery ,100% compatible with the OEM acer aspire 4710 battery. - This Replacement acer aspire 4710 battery has been tested and validated on acer systems to ensure it will work with your notebook. - The replacement battery for acer aspire 4710 features: long battery life and maximum power, quick-charging! - Condition : New brand, High quality,1 year warranty, 30 days money back!